Heroes, Heroines, and History: You've Got Mail: A History of the Mailbox with Giveaway! You've Got Mail: A History of the Mailbox with Giveaway! There are a lot of things in our everyday life that we don't even think about, but without them our civilization would be drastically different. One of these is the mailbox. I'd never paid much attention to them, but one day as we were driving along and I was staring out the window trying not to get car sick as we wove in and out of the Missouri Ozarks, my brow quirked. How did mailboxes come about? They're all the same shape and very uniform in most cases. When did that happen? Before the 1850's, mailboxes didn't exist at all. When you had to go to the post office to purchase postage anyway, there was no need for a mail receptacle anywhere else. But with the invention of the postage stamp, came a need for such a device. Around 1863, folks in the United States began enjoying Free City Delivery. Letters and mail would be delivered to each doorstep, free of charge. During this time period, you would have the letter carrier knock on your door and wait for you to answer. He'd then hand you your mail with a smile, say a few neighborly words, and be on his way. This worked for quite a while, but eventually the business side of letter delivery won out. 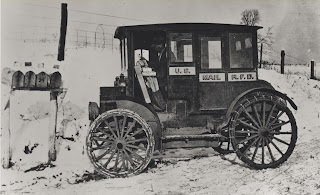 Around 1916, efficiency experts estimated that a mailman lost about 1.5 hours every day waiting for patrons to open their doors and receive their mail. That's when the Post Office Department issued an order that every household or business had to have a mailbox or slot to receive mail. The first form of mailboxes were attached to an outer wall, and this developed as early as the 1880's. But often, doorsteps are far away from the street, and it takes time for a mail carrier to walk back and forth from his vehicle. To reduce the time required, a proposition was made to attach the mail receptacle to fence posts, lamp posts, etc. While this idea was initially rejected in the city, it did catch on in rural areas. This allowed a postman to deliver mail to several farms in a more efficient manner using a horse drawn wagon, or eventually, a motor vehicle. But it wasn't until 1923 that the Post Office Departement mandated a curbside mail reciprocal for every household and business. Where did the unique shape come from? Did you know the mailbox shape actually has a name? It's called the Joroleman Mailbox, named after the Post Office employee that designed it. Joroleman had a degree in mechanical engineering. In 1915, he designed a light gauge, painted steel box of a rectangular shape, but with a domed top which prevented rain and snow from accumulating too heavily, would hopefully decrease deformation of the boxes, and decreased mass production time to boot. His finished design was durable and inexpensive and became increasingly popular. In 1923, the United States Post Office Department (now known as the USPS) gained the authority to regulate mailbox sizes and designs. This is why your mailbox is stamped with either "U.S. Mail" or "Approved by postmaster." And what about the little red flag? Joroleman had that on his design as well. Originally it was used not just to alert the postman of outgoing mail, but also for the postman to indicate to the patron that he had delivered the mail. A real convenience in nasty weather. Amber Schamel writes riveting stories that bring HIStory to Life. Visit her at www.AmberSchamel.com, or subscribe to her Newsletter. I love this blog! I learn things that I never would have thought about. Thanks for sharing. I'd love to win your book. Thanks for the opportunity. Amber, I thoroughly enjoyed learning these facts about our US postal system. I still get thrills when I know "I've got mail" and since j live in the country, it is a great convenience. Congratulations on your new release and continued blessings! I'm so glad you enjoyed it. I had fun researching it as well. I live out in the country too, so you and I would be the ones most glad for mailbox service. LOL. Got your name in the drawing! Absolutely loved that tidbit! I guess I'm pretty shallow, I take so many simple things for granted and never wonder "why"!!! Thank goodness writers like you do ask the question!!! Thanks for the giveaway! Thanks for coming by and visiting with me today! I really like the old wall mailboxes. I think they're cute. :) But I do understand it must be MUCH more convenient for the carriers to have it out on the street. I've got your name in the drawing. Best wishes for winning the book! What a great gift for a mailbox, Amber. Any mailbox will be thrilled to hold your book. I loved reading your info about the mailbox. So very interesting! One of the highlights of my day is going to the mailbox. I love checking the mail and seeing what treasures might be inside. Thank you for this wonderful giveaway! Have a great day! I find it so interesting how sentimental the mailbox has become. That's one of the things that made me look into it. The unique shape has become almost an icon in our culture, so I was curious. Thanks for sharing. I've got your name in the drawing! What a cool bit of history! Thank you for this interesting post. It made me think of all the different mailboxes I've had through the years. My favorite was when I lived in Minneapolis. It was a slot in my front door, which had a spring-loaded flat that kept it shut. Congratulations, Amber, on the release of Dawn of Liberty! That sounds lovely. I like the slots in the doors too. I've got your name in the drawing. Fascinating! Thanks for the history lesson. There are so many things around us that we don't even notice or think about in our everyday lives. Congratulations on the release of your new book, Amber. Would you believe I have a cousin of the same name? She was named after a character in her mother's favorite romance novel. Thanks for the giveaway! Really? How neat! Which novel is that? Thanks for stopping by. I have your name in the drawing. Wow. That would be kinda neat, but I imagine it isn't efficient at all. Unless you count the money they earn from tourists. This was very interesting, thank you. This looks like a great book. Awesome, Deanna! I pray Sam's stories bring HIStory to Life for you. Best wishes in the giveaway! Every time I go to our rural mailbox I'll think about this delightful article. Thanks, Amber! So glad you enjoyed it! Thanks for stopping by, Linda. Thank you, Linda! I'm glad you enjoyed it. 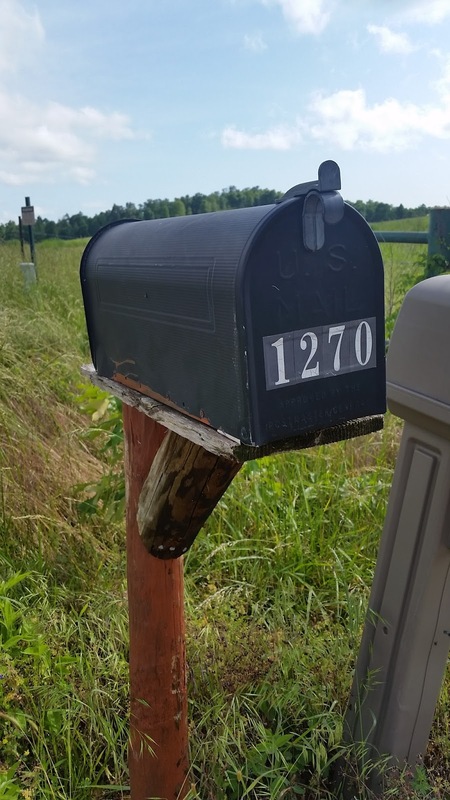 Thank you for this interesting post on mailboxes, Amber - and thanks for the opportunity to win a copy of 'Dawn of Liberty'!! Looking forward to reading it!! Thank you for stopping by, Bonton! I'm glad you enjoyed the post. Best wishes in the giveaway! Gone are the days of the Pony Express. I give a pat on the back to our United States Postal Service. Sometimes my mail has been late but it has never been lost. It really is amazing, isn't it? During the early American days it was faster to get a letter to England than to other parts of the United States. Now we can get a letter almost anywhere in the U.S. in just a few days. Thanks for sharing, Betti. It sounds lovely to have a friendly neighbor deliver your mail. 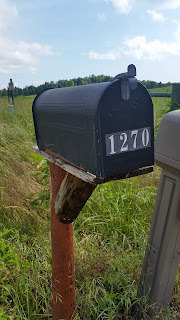 I've always lived way out in the country where you never even see the post man and have to drive to the mailbox to get your mail at the end of the dirt road. I've got you in the drawing. Best wishes! That cover rocks! And I love the title! :) Thank you so much for the chance to win your book! US Postal history is awesome. Thanks for sharing all these cool facts. I never thought about when mailboxes came around for us, but now I know! By the way, that new book is AMAZING. Thanks for a chance to win your book! I grew up in a small town , and remember walking to the post office to get our mail . After college my sister and I lived together for several years and had a box with a top flap that opened and shut attached to the house by the door . After that I lived in a mobile home community and there was a community mailbox of sorts with 16 or so different slots and each person had a key to their box. Congratulations!! I will be emailing you to confirm your address. Bonnie K. won a copy of Sarah Sundin's latest release, The Sky Above Us, given by Cindy K. Stewart. Winners will be notified by email and the winners name will be announced in the days comments. No one under 18 can enter our give aways. No purchase is necessary. All winners have one week to claim their prize. USA shipping only. Offer void where prohibited. Odds of winning vary due to the number of entrants. Heroes, Heroines, and History. Picture Window theme. Theme images by enjoynz. Powered by Blogger.